This is less like a house and more like civilised camping. After a long history of family camping trips these clients decided to formalise the arrangements. We are taking precedent from what they love about a camping lifestyle, while incorporating a few luxuries such as a full size oven and a Japanese style bath. The creation of buildings that embody “everything you need and nothing you don’t” is an honourable one; the pursuit of buildings that simultaneously evoke joy and delight even more so. How refreshing to visit Dogtrot House; a simple, refined building on the far south coast that successfully achieves both. Located in a somnolent hamlet on the south coast, this is a dwelling that responds powerfully to its site, its location and to a very clear client brief. Designed for a family of committed campers, the request was for a building that captured everything they loved about camping without the end of holiday pack up: a permanent, civilised campsite. 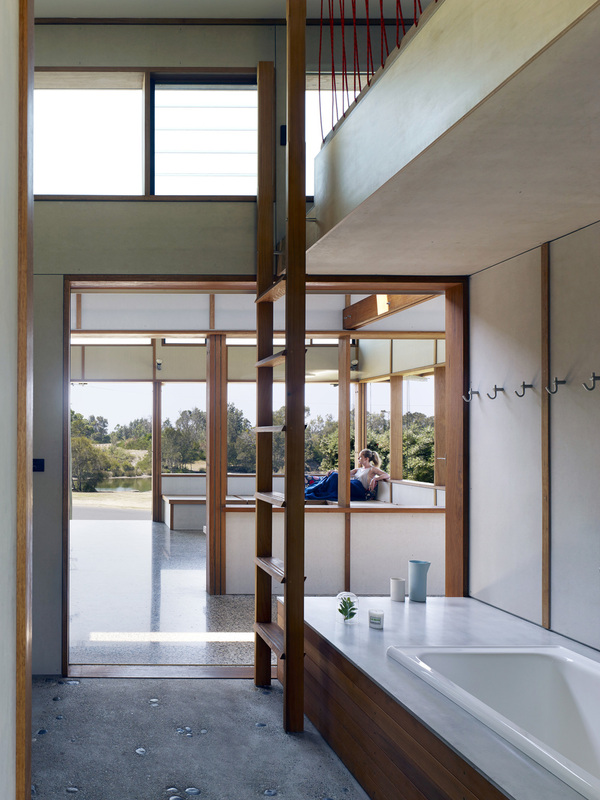 The architect’s response offers an uncomplicated picture of life as it was in Coastal Australia and now it could be again. Simple layout, materials and living; small budget and footprint. Two modest pavilions one public, one private are joined by a covered open breezeway or ‘dog trot’ corridor. To the south, an uncomplicated sleeping and bathing pavilion. To the north, a pavilion embracing lagoon views and light, and a protected kitchen balanced by a large public indoor/ outdoor room for gathering and enjoying life in the most uninhibited way. The public nature of this space invokes an admiring sense of community mindedness, and an all too uncommon act of generosity.